September | 2012 | Small Farmers. Big Change. I read Michael Sheridan’s reflections about the recent article in The Nation, “The Brawl over Fair Trade Coffee,”but had too many comments to respond on the CRS Coffeelands blog that he hosts. I have a great deal of respect for Michael and always appreciate his thoughtful, intelligent approach and his commitment to on-the-ground development work with farmers. However, while I applaud Michael’s attempts to be objective, I was left puzzled by some of the logic behind his critique of The Nation article and his apparent support for the Fair Trade For All initiative. Michael’s biggest critique of The Nation article seems to be two-fold: 1) while there is near unanimous agreement that “the process by which FT4All came to be violated core Fair Trade values of transparency and dialogue” and the fact that the initiative includes elements opposed by most of the Fair Trade community, it is somehow unfair to criticize the initiative until we see the results; and 2) those who criticize “corporate” Fair Trade are not recognizing the benefits it has generated for smallholder farmers. 1. Is it possible to “empower” farmers with one hand while stripping away their power with the other? In a system whose very foundation and philosophy was built upon the principles of strong and equitable relationships, democratic processes, deep integrity and trust, can an organization take unilateral actions which fly in the face of all those principles and still expect their initiative’s results will be judged impartially? Is it even possible to evaluate results while ignoring process when the whole basis of the Fair Trade system is to create a new way of conducting trade and doing business which most of all includes respect and integrity? Authentic Fair Trade: Where are we and where are we going? 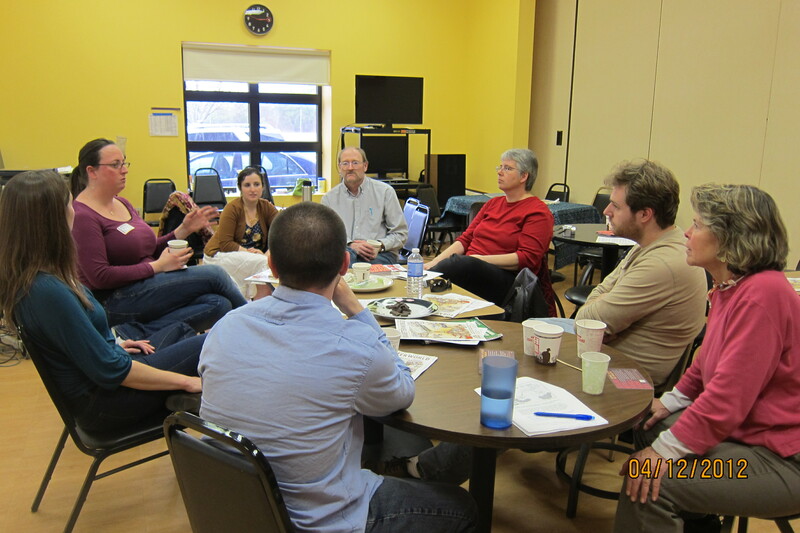 Rink Dickinson and other Equal Exchange staff discussing current issues in the Fair Trade certification system with representatives of east coast food co-operatives. A Win for Consumers and Authentic Fair Trade Advocates! We just received the following press release from our friends at Dr. Bronner’s. New York, NY – Sept. 17, 2012 – A National Advertising Review Board (NARB) panel has recommended that Fair Trade USA – formerly TransFair – require users of the organization’s “Fair Trade Certified” seal for composite products to provide additional information to consumers. By way of background, Dr. Bronner’s Magic Soaps, manufacturer of personal care and cosmetic products, challenged before the National Advertising Division (NAD) the truthfulness and accuracy of claims made with respect to “Fair Trade Certified” seals licensed by Fair Trade USA. Dr. Bronner argued before NAD that the use of the Fair Trade USA “Fair Trade Certified” ingredient seal for composite products falsely implied that fair-trade sourced ingredients constituted a substantial part of the product. NAD determined that use of the “Fair Trade Certified” ingredient seal on the front panel of product packaging – in a context that included a statement of fair trade sourced ingredients on the front panel and identification of fair trade sourced ingredients in the ingredients panel – accurately conveyed the degree to which fair trade sourced ingredients are included in the product. Dr. Bronner appealed NAD’s determination to the NARB. Specifically, the panel found that the placement of the “Fair Trade Certified” ingredient seal on the front of a package conveyed a message of significance to consumers. You may have heard about a new meta-study by researchers at Stanford University that looked into the health benefits of organic foods. It was covered by the New York Times, NPR, TV news programs and others. Unfortunately many will not read past the often misleading headlines that suggest, or outright declare, that organic foods are not healthier for you than ‘conventional’ foods (meaning those foods grown with the use of synthetic fertilizers, herbicides, pesticides, GMOs and – for livestock – with artificial growth hormones, antibiotics, etc.). We believe that a careful reading of the study does confirm that for many foods there is a demonstrable health benefit in eating organic, either directly because the organic foods can be more nutritious, or indirectly by reducing one’s exposure to chemical residues and antibiotic-resistant bacteria. To learn more about this perspective on the study’s findings please check out this message from the Organic Trade Association, and their nutritional information page. It is also about challenging an increasingly industrialized, homogenized, large-scale form of agriculture that seems to work only for large ag corporations (think of Monsanto, Cargill, ADM, ConAgra) and food conglomerates (Kraft, Nestle, etc), but not for farmers, workers or farming communities. In the U.S. alone over 1 billion of pounds of pesticides are applied annually. Globally over 5 billion pounds of pesticides are used every year. And much of it ends up not just on your food, but in the soil, streams, rivers, estuaries and bays. It also ends up on farmers and farm workers, and in their lungs, and so on. Every year there are about 1 million serious accidental pesticide poisonings world-wide. A close look at the use of synthetic fertilizers also raises many important environmental problems, especially around climate change. At Equal Exchange we’ve been working with farmers for 25 years and consequently think about conventional, chemical-intensive farming through this broader lens. And ever since we imported our first shipment of organic coffee (around 1990) we’ve been trying to maximize our support for organic farmers. Today about 98% of the coffee, tea, cocoa, sugar, bananas and other foods we import are certified organic (and even some of the remaining 2% are crops from not-yet-certified organic farms). We could go on, for example, about the many ways organic farming benefits wildlife, or it how strengthens the economy of farming communities, but we think you get the picture. Now I think I’ll end this post and go have some organic mac ‘n cheese.